Disclaimer: The information on this page is intended for individuals who have been medically diagnosed with soft tissue injuries in the knee resulting in swelling in the knee. It is important to visit a qualified medical professional in order to rule out any other possible causes prior to considering any advice or treatment option. Is a swollen knee causing you pain and discomfort and possibly affecting your ability to get out and move around, or just affecting your lifestyle in general? The OSMO Patch is completely natural and when used together with proper rest is ideal for supporting the relief of swelling and pain associated with fluid on the knee and swollen knees. Water or fluid on the knee is a term used to describe the excess fluid that accumulates in or around the knee joint resulting in swollen knees. Some of the common factors that may have caused this condition include overuse injuries, trauma, or an underlying disease or infection. Doctors refer to this condition as knee effusion. To determine the real cause, your doctor will take out a sample of the fluid for testing. Once the cause is determined, she or he will perform an appropriate solution to remove the excess water accumulation. This will help reduce the pain or stiffness associated with fluid on the knee. What are Fluid on the Knee Symptoms? Pain – depending on the severity of the condition or the cause of the water build-up, the pain can be excruciating. Patients find it impossible to get up. Stiffness – when you try to get up especially in the morning, you may find your knee unable to bend as you normally do. Swelling – when excess fluid accumulates in your knee joint, it will appear larger than the unaffected one. You will see puffiness around the knee’s bony parts. What Are the Causes of Fluid on the Knee? Traumatic injuries. If you have sustained an injury to the ligaments of your knee after an accident, the body’s natural reaction is to produce protective fluids. Common examples of traumatic injuries that result to the fluid accumulation are ligament tear, broken bones, and meniscus tear. Overuse. This is another most common cause of water build-up, which can also be considered another form of traumatic injury on the knee. If you are not training properly, and go beyond your personal limits too fast, it may cause a trauma on your knee resulting to swelling, pain, and fluid build-up. Degenerative changes resulting in irritation can also be the cause of the water on the knee. These conditions can result in swelling, stiffness and joint deformity. Diseases such as tumor, cysts, infection, or bleeding disorders may also be the causes of the water build-up in the around the knee joint. To determine the cause, your doctor may require an x-ray view to see if there is any broken or dislocated bone in your knee, or find out if the real culprit is irritation due to wear & tear. A magnetic resonance imaging (MRI) test may also be needed to detect any abnormalities of the knee joint such ligament, tendons or cartilage tear. Your doctor may also request for a blood test to determine if there is any evidence of infection or other possible cause. Treatment for this kind of condition includes medications (pain relievers, antibiotics, corticosteroids) and surgical procedures. If a surgical operation is suggested then your doctor may aspirate the fluid on the knee and inject a corticosteroid into the knee joint to treat the swelling and inflammation. The OSMO Patch is 100% natural and is able to draw fluid from the body supporting the reduction in swelling and pain due to swollen knees, making it ideal for fluid on the knee. So regardless if you are looking for a product to support your current swollen knee treatment or if you are a person that simply prefers to use natural products, then the OSMO Patch may be the answer you are looking for to naturally reduce the swelling and associated pain and relieve the swelling in your knees. The OSMO Patch is simply stuck over the affected area just before going to sleep where it can then go to work reducing swelling and stimulating blood flow continually throughout the night. When you wake-up in the morning simply remove and discard the used patch. This process is then repeated each night as required. 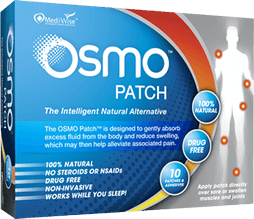 So if you are ready for a natural approach to supporting the relief of pain and swelling in the knee then the OSMO Patch is the Answer!ORDER the OSMO Patch Today!